When I first came on board the Wilson Center last Earth Day, I wrote that I wanted to forge new paths and identify ways that reproductive health, environmental conservation, and women’s empowerment affect our lives today and in the future. That continues to be a goal today. The theme of this year’s Earth Day is “green cities” – how to manage urban growth without destroying the environment. This is a monumental question and one we’ve explored in a variety of ways. In January, reporters and editors from The New York Times, National Geographic, The Guardian, Bloomberg BNA, and The Daily Climate discussed population growth, including urbanization, as one of the biggest near-term global challenges. “How you head towards nine billion people with the fewest regrets is not a news story – it’s a question, and anyone who says that there’s single answer is not being truthful,” said Andrew Revkin of The New York Times’ Dot Earth blog. How the world adds 2.5 billion new urban residents in the coming decades is going to shape enormously the livelihoods, the wellbeing, and the environmental security of those urban residents, and our societies, and our economies overall. Many of the world’s fastest growing cities are the most vulnerable to climate changes, and are located in regions where women have very limited access to family planning. ECSP consultant Kathleen Mogelgaard, in an event at the Wilson Center earlier this month, pointed out that meeting the reproductive health needs of women in these places can yield “double dividends,” reducing the number of people in vulnerable areas and making them more resilient to all kinds of change. I recently spoke with the United Nations Foundation about why I care about reproductive health as part of a series of profiles they are doing with people who work on international development. Part of my answer was that I have seen the power of integrated development efforts that combine reproductive health with environmental and economic goals. These population, health, and environment (PHE) efforts empower women, inform men and boys, and end up producing more substantial sustainable development results than many single-sector efforts. This approach has much to offer to the urban space as well. Take for example Bangladesh. When it split from Pakistan in 1971, it had a slightly larger population and similar levels of health care. But in the decades since, Bangladesh has made reproductive health and girls’ education a priority, while Pakistan has not. Both countries face severe urbanization and climate challenges, but today Bangladesh has nearly 30 million fewer people, women have more options, and the country’s narrative is about resilience rather than vulnerability, wrote Saleemul Huq of the International Center for Climate Change and Development on New Security Beat in January. When it comes to more sustainable cities, we cannot forget that women are at the center. Empower women, a process that starts with health and education, and we’ll go a long ways towards building more resilient, healthier, and greener cities. 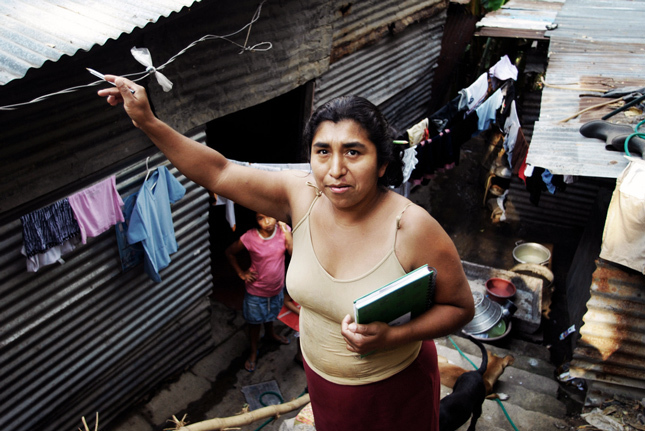 Photo Credit: Woman in an El Salvadorian neighborhood participates in a disaster prepardness project, courtesy of Tineke D’haese/Oxfam (via the European Community Humanitarian Office). Video: UN Foundation.